100% Neem Oil is available in an 8 oz, quart, or gallon size. The seeds from the Neem Tree is the source for this unique organic insect control. For use on vegetable and flower gardens, ornamentals, and fruits crops. This product works by disrupting the reproductive and digestive cycles of various insects that attack plants. It is non-toxic to birds, beneficial insects (ladybugs, bees, etc. ), and mammals. Dilute solution of 100% Neem Oil with water. Bonide Pyrethrin Garden Insect Spray uses the active ingredient Pyrethrins which is an organic compound derived from African Chrysanthemum flowers and can be used until the day of harvest. 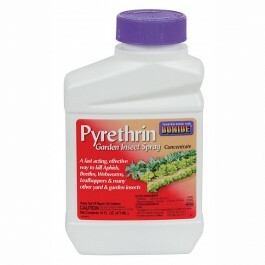 Use this product on plants in your lawn and garden including vegetables, fruits, ornamentals, flowers, and roses. Bonide Pyrethrin Garden Insect Spray can safely be used on your most delicate ornamentals, but is still strong enough to keep your garden safe from insect pests. The Monterey Bug Buster contains a synthetic pyrethroid insecticide to control spiders, roaches,ants, crickets, aphids, catepillars, leafhoppers, and other insects on vegetables and ornamentals. Bug Shooter Garden Spray (previously known as Sharpshooter Spray) is great all-organic insecticide primarily made from lemon juice extracts. Kills ants, aphids, bean beetles, cabbage looper, caterpillars, earwigs, flea beetles, Japanese beetle (adult stage), leafhoppers, mealy bugs, mites, rose chafers, scales, snails, slugs, mosquitoes, cockroaches, palmetto bug and whiteflies (adult stage). Can be used on most ornamentals or vegetables you grow. Harmless to pets, humans and the environment. Add 1-quart to 7 gallons of water. Spray at first signs of pests. Can be used up to harvest day. Package warning: Do Not Use on mature red fruits (raspberries or strawberries). Don't spray when temperatures reach beyond 90 degrees. Do Not spray on open blooms or wilted plants. It is not advised to use in conjunction with other spray-on liquid fertilizers or other pesticides. Diatomaceous Earth (DE) is a long-lasting powder (just the shells of freshwater diatoms) that pierces the skin of crawling insects such as roaches, ants, fleas, beetles and slugs causing dehydration and death. Pests don't become immune to its effects. Can also be used as a control for internal parasites in livestock. Mix at a rate of 1% of the ration. A dust formulation containing B.t. Highly effective, this biological insecticide is used to control cabbage leappers, imported cabbage worms, grape leaf folder, and sod web worms. 1 pound covers an average of 3,600 square feet. Garlic has been used since ancient times to repel insect pests. Garlic Barrier contains only garlic oil and water. It offers farmers and gardeners an easy-to-use alternative to chemical insecticides. Spray plants early in the season before insects have arrived because product will not disperse existing infestations. Four to eight applications per year can be made at ten day intervals. Pints and quarts are a weaker concentration than gallons. Mix pints and quarts using 1 part Garlic Barrier to 10 parts water. Mix gallons using 1 part Garlic Barrier to 100 parts water. Also effective at repelling mosquitoes. Mix as above and spray yard, trees, shrubs and brush around your home. Mosquitoes are repelled for up to 3 months. Sound too good to be true? There's lots of research and trial information to prove Garlic Barrier's success. See our website for information. Greenlight Rose Defense for control of blackspot, powdery mildew, rust, spider mites, aphids, whiteflies, and other pest on roses and other ornamentals. Made from neem oil. Hasta La Vista Ant! is ready to use weather/moisture resistant granular bait. It kills and controls ants, cockroaches, crickets, mole crickets,and silverfish. An easy-to-use spray (concentrate or ready to use) that controls scale insects, mealybugs, apple aphids, European red spider mites, leafminers and many more pests.Works by smothering the insects. General usage: Use year-round on fruit trees (pears, cherries, peaches), shade trees, evergreens, ornamentals, flowers (roses), vegetables (asparagus, corn, peppers), and house plants. Directions for use: Concentrate - mix 2.5 to 5 tablespoons per gallon of water, depending on instructions with product. Hot Pepper Wax Spray is derived from cayenne peppers. Capsaicin, the active ingredient, is combined with paraffin, mineral oil and eleven insect-repelling herbal extracts. The spray has multiple functions. First, it sticks to plant leaves to form a transparent barrier that shields the leaf from insect-transmitted and airborne diseases. Second, when covered with the spray, soft-bodied insects will die within 24 hours. Third, it functions to ward off pests for up to 30 days. Finally, it acts as an anti-transpirant. Irrigation needs can be reduced by 20% because leaves will release less water. Hot Pepper Spray is registered for use on most vegetables and there is no known phytotoxicity. Available in ready-to-use quart bottle or as a pint of concentrate. When using the concentrate, mix at an initial rate of 4 oz./gallon. Repeat every 1-2 weeks until control is achieved. Use a maintenance rate of 2 oz./gallon every 2-4 weeks thereafter.Use on roses, orchids, cut flowers, house plants, orchards, and field crops. This organic insecticide is made from natural pyrethrin. Use this product all year round, up to the day of harvest, to effectively control whiteflies, worms, caterpillars, aphids, and more. A selective natural insecticide that controls japanese beetles on vegetables, flowers, ornamentals, trees, and shrubs. Makes a useful addition to your program for controlling white grubs in lawns (including hand-picking, beneficial nematodes, and milky spore). May be used indoors and outdoors throughout the season. Can be applied to fruit and vegetables on day of harvest. A combination of cottonseed oil, clove oil, and garlic extract. Mite-X controls Mites, Thrips, and Aphids. Can be used on vegetables, fruits, nuts, berries, herbs, ornamentals, greenhouse plants, and interior plants. OMRI LISTED. This is a new agricultural chemistry introduced into the homeowner market. Produced by fermentation, it can be used on outdoor ornaments, lawns, vegetables, and fruit trees to control caterpillars, leafminers, thrips, borers, beetles and more. Also used to control fire ants in lawns and other outdoor areas. NOTE: This product can not be sold/shipped to Michigan. This spreader/sticker is made from cottonseed oil. Use it as a wetting agent with insecticides, herbicides, and fungicides to make them more effective. Safe on lawns, ornaments, fruit and nut trees, and vegetable crops. Insecticide made of natural pyrethrin and canola oil. Safe to use on vegetables, fruit trees, houseplants, ornamental plantings such as flowerbeds, groundcovers, shrubs and more. Controls aphid, beetles, mealybugs, caterpillars, plant bugs. Great for spot application. Controls ants, aphids, beetles, weevils, caterpillars, armyworms, sawflies, and chinch bugs with this two-in-one insecticide. Combines insecticide soap which weakens the insect's protective outer shell and pyrethrin (does not contain PBO's) which kills the insect by disrupting its nervous system. RTU contains .01% pyrethrins, 1% potassium salts. Concentrate contains .2% pyrethrins and 20% potassium salts. Use 5 oz./gallon of soft water. This Ready To Use pump spray contains a blend of Rosemary, Cinnamon, Thyme and Wintergreen oils to kill stink bugs within 3 to 5 minutes. Can be used indoors and outdoors. Not for use on plants.